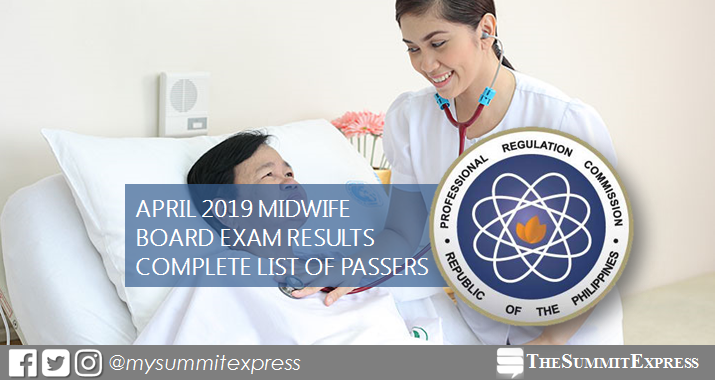 MANILA, Philippines – The April 2019 Midwife board exam results including the official list of passers, topnotchers (top 10), top performing schools and performance of schools are released on Tuesday, April 16, 2019 or in three (3) working days after the last day of exam. As announced, 460 out of 1,416 passed the exams. PRC conducted the Midwives licensure exam in the cities of Manila, Baguio, Cagayan de Oro, Cebu, Davao, Iloilo, Legaspi, Pagadian, Tacloban, Tuguegarao and Zamboanga on April 10 and 11, 2019. From April 22 to April 23, 2019, registration for the issuance of Professional Identification Card (ID) and Certificate of Registration will be done on-line. Please go to www.prc.gov.ph and follow instructions for initial registration. Midwife board exam's verification of ratings (passers, non-passers and removal) can be done online. The two-day midwives board exam covered the following subjects: obstetrics, fundamentals of health care, infant care and feeding (April 10) and primary health care and professional growth and development (April 11). According to PRC Resolution No. 1127, the target release of results for the recent Midwife board exam is on Tuesday, April 16 or in three (3) working days after the exam. Note that result may be released ahead of the target or on later date without prior notice. We advise takers to monitor announcement of results starting Monday. In the same period last year, results were released in three (3) working days. PRC named 846 out of 2,145 who successfully hurdled the tests. Dennis Michael Esteban Zequerra of Cotabato Medical Foundation College aced the Midwifery board exam with 91.75%. In the April 2017 examination, results were out in 3 working days. A total of 965 out of 2,194 passed the Midwife Licensure Examination. Kathryn Avery Antonio Aldave from Catanduanes State University (CSU) - Virac topped the board with 91.45%. Monitor this page for the real-time updates on Midwife board exam results. Check out also the official website of PRC for more information.